How to Fix Windows Store Error 0x8024600e? Home »	Fix » How to Fix Windows Store Error 0x8024600e? Issue: How to Fix Windows Store Error 0x8024600e? Hello. 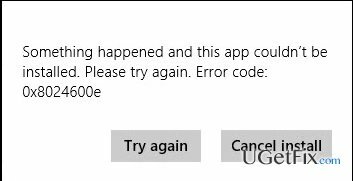 When I try to install Travel, Finance, News, and Weather updates on Windows Store, I receive an error code 0x8024600e. Tried to reboot the system and ran sfc /scannow. Have no other ideas what to do. Could you please advice? 0x8024600e is yet another Windows Store error, which prevails on Windows 8 and 10 versions. The environment, the error type, the frequency and other factors of this error is very much the same as error code 0x80073cf9. However, the culprit of these bugs does not match, so the fixes are not the same. Press Windows Key + R combination, type regedit in the Run dialog box and hit Enter to open the Registry Editor. Using the left pane, navigate to HKEY_CURRENT_USER\Software\Microsoft\Windows\CurrentVersion\Explorer\User Shell Folders. Find Cache on the right, double-click it, and type %USERPROFILE%\AppData\Local\Microsoft\Windows\Temporary Internet Files Value. After that, click OK and reboot your PC. If the User Account Control message occurs, click Yes to proceed. Click Win key + S and type msconfig in the search bar. Select System Configuration and navigate to the Services tab. Mark Microsoft Services box and then select Disable all. Press Ctrl + Alt + Delete to Open Task Manager. Open Startup and disable programs that are set to boot during Windows startup. After that, check if the issue persists. If you can now successfully download and install updates on Windows Store, then you should repeat the three steps listed above and select several Microsoft processes to enable. Once done, check if the 0x8024600e error did not reappear. Perform these steps until you find which process is the culprit of the issue. Finally, once you fix this Windows Store bug, perform a thorough PC’s scan with Reimage to ensure that there are not corrupted registries, faulty system files, malware, and similar problems that may negatively influence Windows performance.